My aunties always send the loveliest gifts, and this Christmas suprised me with two gorgeous cookbooks from Yotam Ottolenghi and Sami Tamimi. 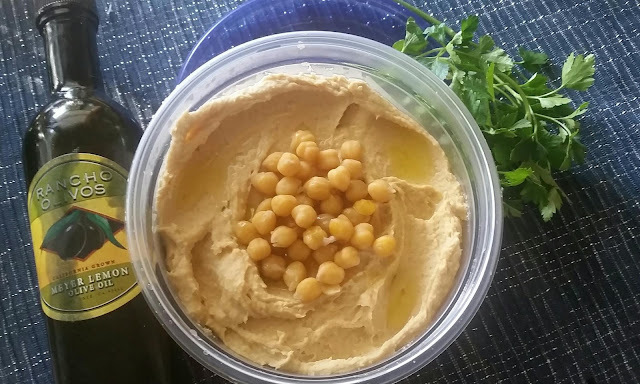 I hadn't made chickpea hummus in years, since there are a number of great local brands and chickpeas have always been the most challenging beans to cook from dry. I figured, though, that with the expertise of these two guys, I'd give it another try. Oh, my goodness. So delicious, so worthwhile, and I've now made evenly cooked chickpeas for the first time in my life. 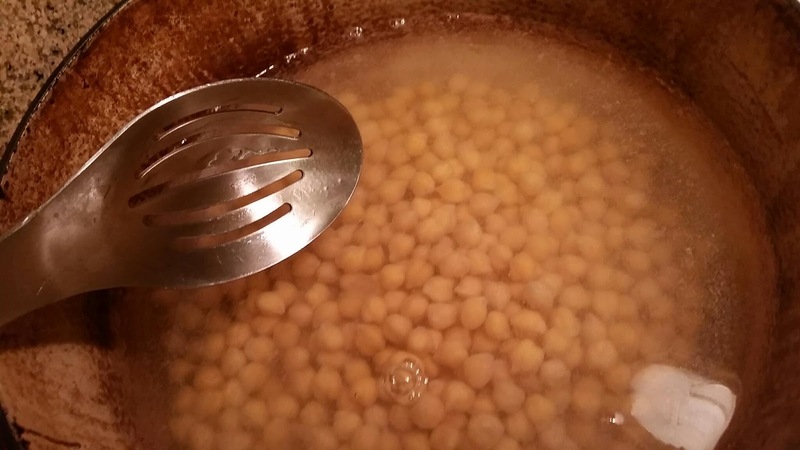 The trick to getting them just right, as it turns out, is cooking the soaked beans with a little baking soda before adding the cooking water. The abrasive baking soda softens up the skins. I've made a couple of small adjustments to the other ingredients to get the balance of flavors right where I like it, and I hope you'll do the same! 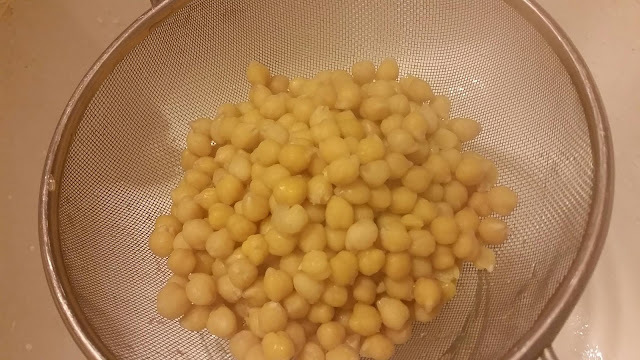 First, rinse and and look over 1 1/4 cups dried chickpeas. Why? Because beans used to come with little special extras like pebbles and clumps of dirt. I don't think I've found any of those in recent years, but I'd still rather be safe than sorry! 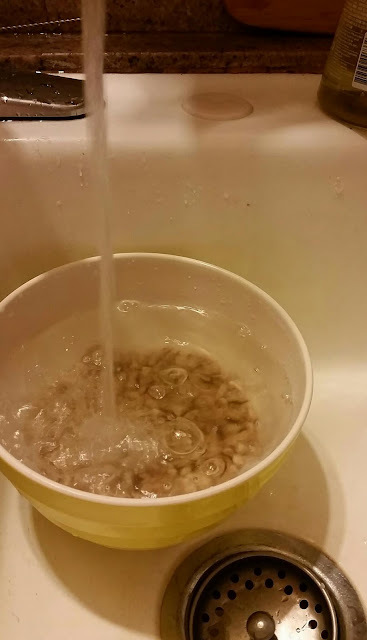 Soak the beans in enough water to cover them twice. 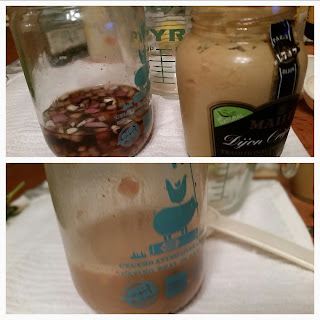 I don't usually bother soaking other beans, but in this case I will definitely follow that step. 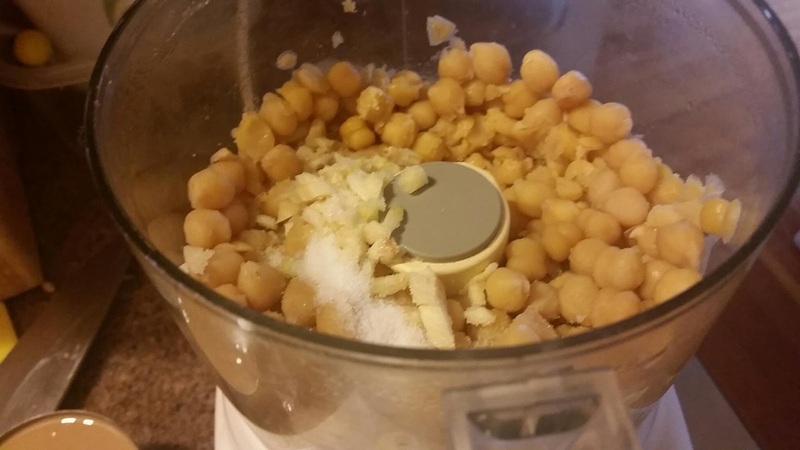 If you're short on time, two cans of chickpeas would be the right amount to start with. Soak overnight or at least six to eight hours. 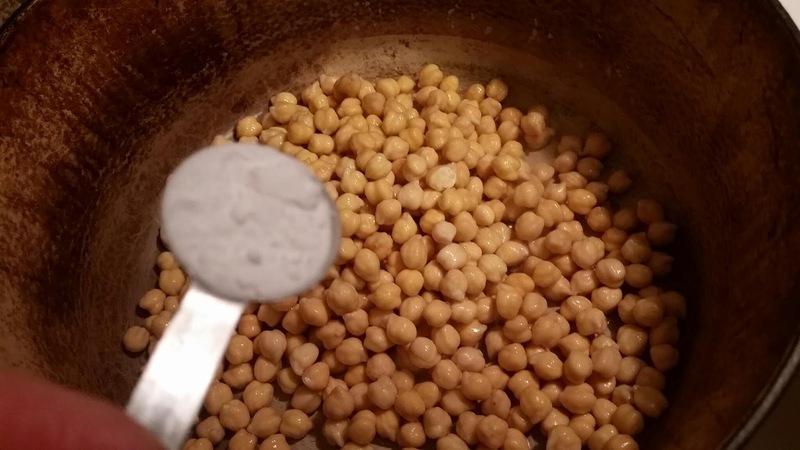 Drain the chickpeas and put them in a 4-5 quart pot with 1 tsp baking soda. Stir and cook for three minutes over medium heat to loosen the skins up--this is the magic step right here, so don't skip it! Add about 6 1/2 cups of water to the pot and give it a good stir. Set a timer for 20 minutes and turn the heat up to high to bring it to a boil. Skim off the foam that forms and any beans or skins that float to the top. Then turn the heat back down to medium-low to let it simmer. Start checking the chickpeas for doneness when the timer first goes off. 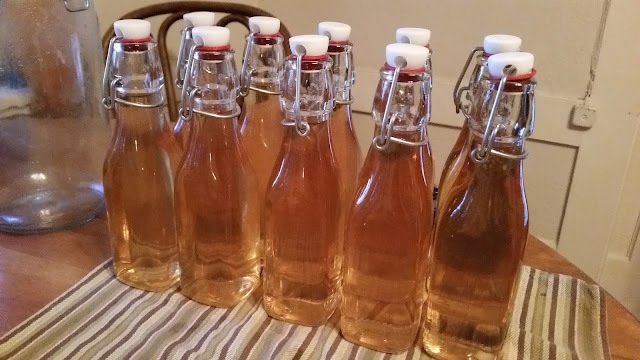 You may need to go up to twenty more minutes, depending on how far back in the stockroom your beans were, but both my batches were done at the first check. 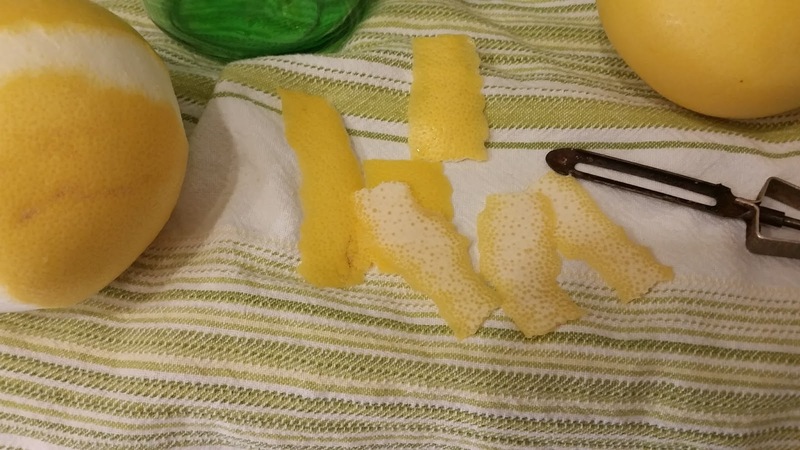 Squeeze 2-4 fresh lemons until you have 1/3 cup of juice. 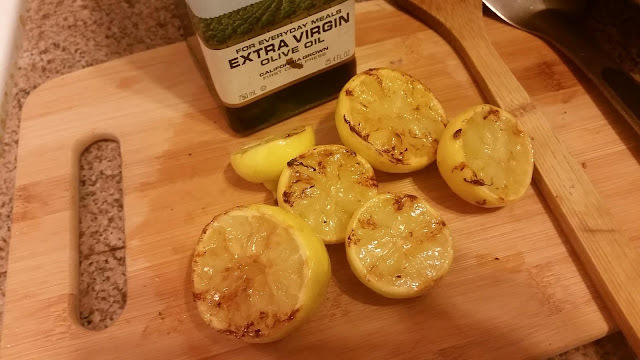 I charred mine on a grill pan this time...it only added a little extra flavor to the hummus, but it softened up the lemons a lot, so they gave off more juice. 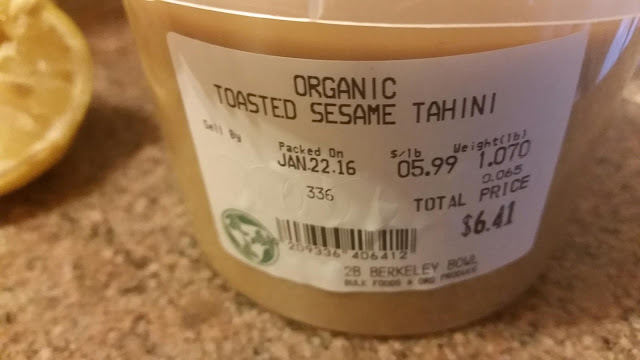 Measure out 1 cup of light tahini, crush 2-4 garlic cloves (depending on your taste and their size), and set out 1 tsp salt and 1/3 cup cold water. Drain them well, reserve about 1/3 cup for garnish, and place the rest in a food processor. Pulse them to start the purée. Open the lid and place in the salt and garlic, then put the lid back on, start the machine and add the tahini, juice and water through the top while it runs. Add a little more water if it's still too thick for your liking. Serve room temperature, topped with the intact chickpeas and a drizzle of your favorite olive oil. You'll note the elegant bowl I selected: I'm taking most of today's batch to work in the morning! 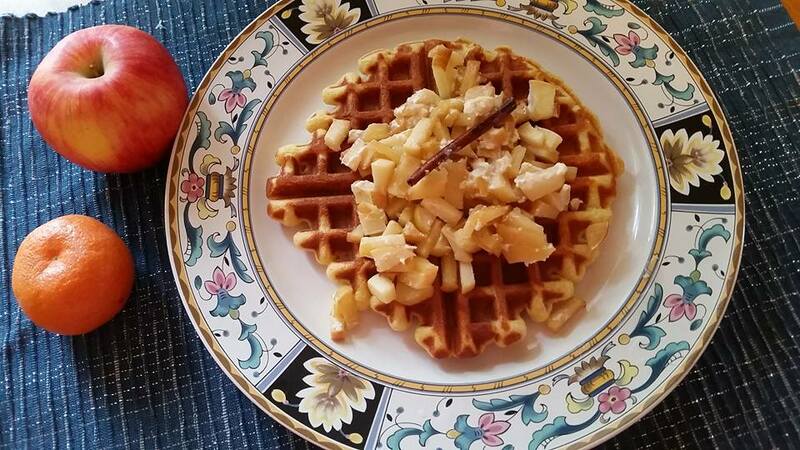 Garbanzo Flour Waffles with Sauteed Apple from Always Hungry? This photo seems to be very popular on FB, so I thought I'd share the recipe. The only change I've made to the waffle part was to double it so I have extra waffles to pop in the toaster during the week, but I replaced his berry sauce with sauteed apples, 'cause that's what I had on hand. The saved weekday waffles will just feel so indulgent! For regular flour waffles on a weekday, I spread them with a little peanut butter for morning protein. This version already has protein and fiber, though, so I'll have them with a little fruit. The recipe is from Always Hungry? by Dr. David Ludwig. Ludwig is the endocrinologist behind most of the research on how different kinds of foods affect our bodies, and now he's written his own book. I'm following his plan, and so far so good...we'll see how it goes long term! Don't worry, I won't give up baking altogether. Dice the apple and saute with oil, water and spices over medium heat. Stir every couple of minutes. When apples are somewhat softened, turn off heat and add the cream. 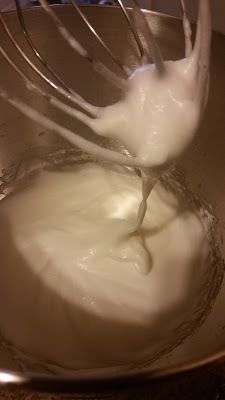 3) Add wet ingredients to dry and mix well. Plug in waffle iron to pre-heat. Carefully fold the beaten egg whites into the batter, making sure no white streaks are left. Pull up from the bottom and turn the bowl with each fold. The batter should be pretty thick. When the waffle iron is ready (mine has a little light that switches from red to green), Open it and lightly brush with cooking oil. Spoon 1/2 cup of batter into the middle of the iron and close, following the iron's directions to know when they're done. Three popular recipes for the One Year Anniversary post! Oh my goodness, it's the one-year anniversary of my first post! To celebrate, here are three of the most popular posts. If you try them, let me know how it goes! Thank you so very much for your support--I'm really loving this and hope to keep it going for a long while. My most viewed liqueur recipe is the one for Arancello, made of vodka infused with blood orange peels and mixed with simple syrup. I saw the first blood oranges of the season in the market today, so this will be in the works again soon! 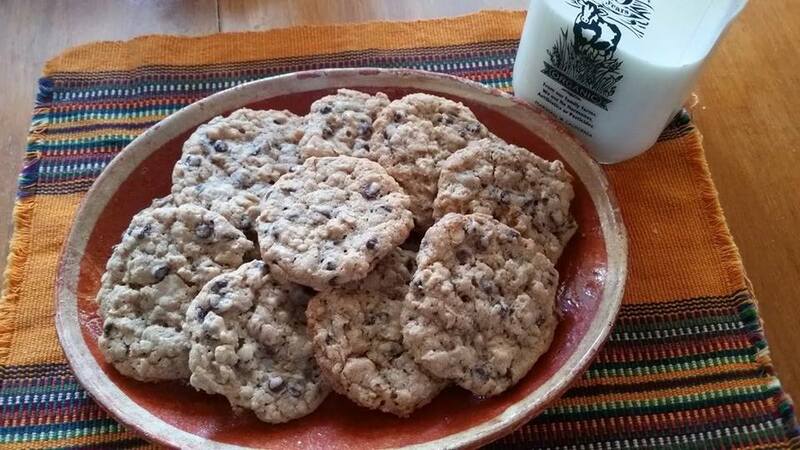 Next up are the Chocolate Chip Oatmeal Cookies I've been making for many many years. They're very simple, and simply delicious! This was also the year I got into using an electric pressure cooker, and the recipes I've made for that have been visited a lot thanks to Pinterest. 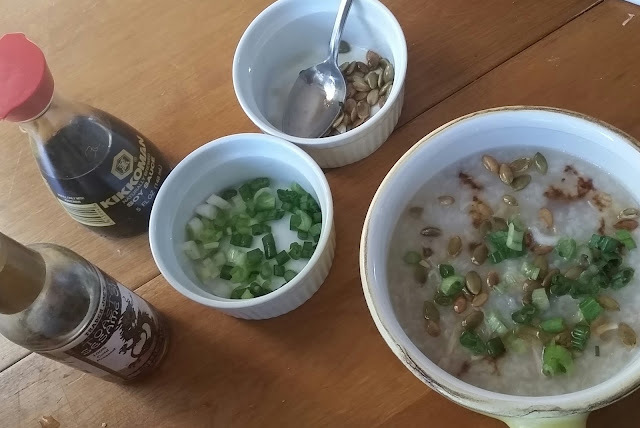 The most popular one by far is the Instant Pot Chicken Jook, a quick recipe for a normally long-simmered rice porridge. Who knew? OK, maybe a few billion people in China. It's January 6...have you fallen off the resolution wagon yet? If my Facebook feed is any indication, the heavy dishes and sweets of the holidays have been replaced by beautiful salads and vegetables. Keeping the veggies interesting can be a challenge some days, like when I get a few days into the one pound clamshell of spring mix I bought. Making homemade dressings and vinaigrettes can help keep the salads and steamed veggies healthy and delicious. 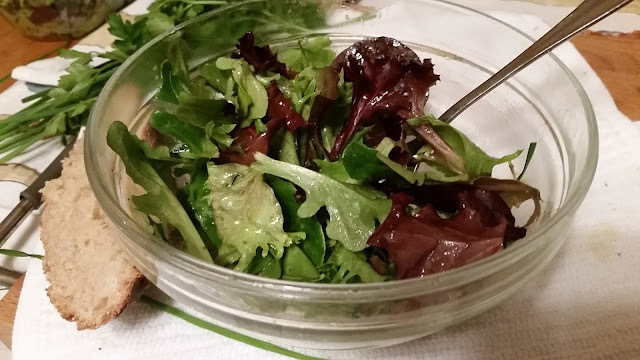 I'm going to show you how I make the basic kind of vinaigrette, and I've provided some links to recipes for other kinds of dressings at the bottom. During my stints at Weight Watchers' meetings, I was often surprised at how many people used bottled fat-free dressings loaded with sugars and preservatives, but had no idea how to work the two required teaspoons of oil into their daily meals. 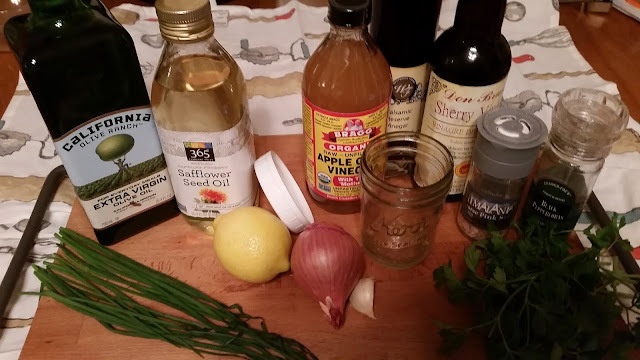 Help me spread the word about how easy it is to make vinaigrettes and other dressings at home! First, the pronunciation. The word has three syllables: vi-nuh-grette. If you really want to torture me some day, say it with four syllables: vi-nuh-gur-ette. Ack! Next, finely chop or mince a small shallot, a clove of garlic or a slice of red onion. Place it in some vinegar in a jar and let sit for a few minutes. You don't have to let it sit, but doing so takes out some of the bite. 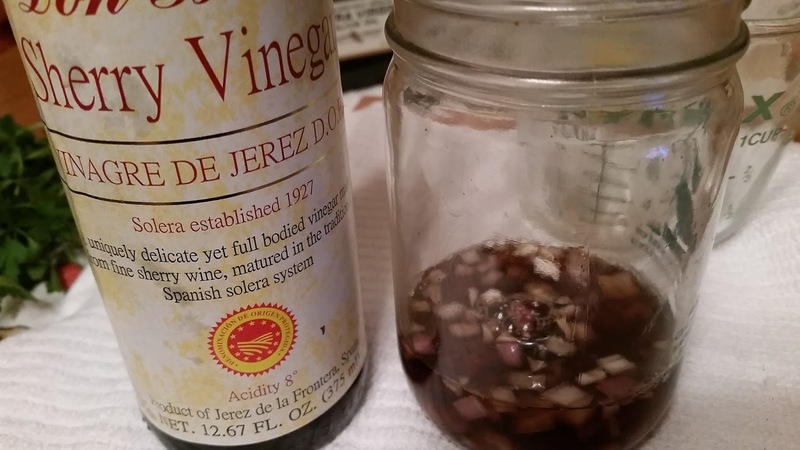 Sherry vinegar is one of my favorites, but you can use balsamic, red wine vinegar, white wine vinegar, or good old apple cider vinegar. Part of the beauty of making it yourself is that you can really tailor it to your tastes. The next step is to add a little prepared mustard. If you want mustard flavor, add a couple of tablespoons. If you don't want too much of that, just add a teaspoon or two. It'll help the dressing emulsify. If you hate mustard, leave it out. You'll just have to shake it up more often. Add a tablespoon of water and then put the lid on the jar and shake up the mixture. Next comes the oil. 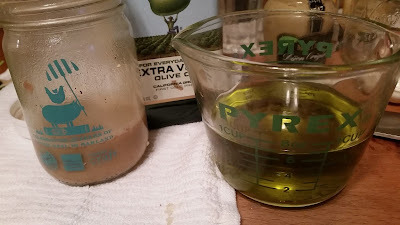 I love olive oil, so that's what I usually use. Sometimes I like something lighter in flavor, though, and go with safflower or grapeseed oil. Again, it's up to you. The usual ratio for oil to vinegar is 3 to 1. I like it a little sharper, so I use more like 2.5 parts oil to 1 part vinegar. Pour in the oil and shake it up again. Now, add some salt and black pepper (maybe start with 1/4 tsp each) and start testing to see if it has enough for you. 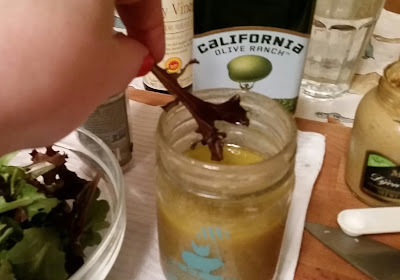 The best way I've found to test it out is to dip a leaf of lettuce (or a bite of broccoli, whatever you're planning to use it for) and see how it tastes to you. Too sharp? Add a little more oil. Needs salt? Add a little more of that. Totally blah to you? Add herbs or spices that jazz it up the way you like it. Use about a tablespoon for each serving of salad or steamed veg. I first learned about grapefruit and tequila the summer I turned 21, when I worked at a resort on Lake Powell. They gave me a job in the restaurant at Bullfrog Marina, on the Utah side, about 70 miles from the closest town. In addition to college students like me, the people I worked with were quite a mix: local people who grew up working there, professional seasonal workers who traveled from summer places to winter ski resorts, and random people who needed something to do and somewhere to be. Somewhere in that mix was a guy named Bob, whose job was to tow boats out of dry dock and schmooze the customers while they waited. After a few too many at parties he would transition into his alter ego, Bobnoxious, but when he came to the restaurant he was very polite and a nice tipper. His go-to drink there was a Torque Wrench, his name for tequila and OJ (apparently there's another cocktail by this name, but that was how he ordered his drinks). Somehow this opened up the idea that tequila could go in things other than Margaritas and shot glasses, and mixing it with Fresca became a favorite. 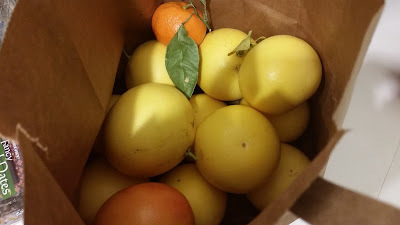 Today, I'm just back from a long visit to Mom's in Southern California, where her dear friend we made jam with a few months ago gave us a giant bag of grapefruit from her yard. Thinking of ways to use them, I thought the peels might make a great infusion with tequila, which could be made into cocktails with the wonderful flavors but without all the sugar or sweetener of juice or sodas. 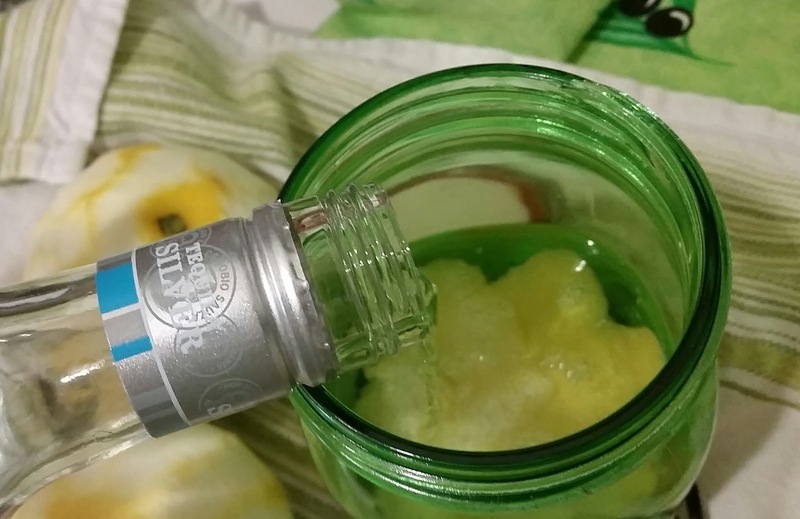 You could use it in a Paloma, too, if you felt like using more ingredients. For this you need to use silver tequila, not too expensive but not too cheap. The gold kind is Anejo, aged in barrels for a more complex flavor that would interfere. For each 750 ml bottle, you need the peel of two grapefruits and a 1 liter bottle. Peel the two grapefruits with a clean vegetable peeler--I suspect this one from mom's drawer is about as old as I am. Avoid the white pith of the peel. If the white on the back of the peels is transparent and porous, you should be OK. If it's thicker than that, pare some off with a small, sharp knife. 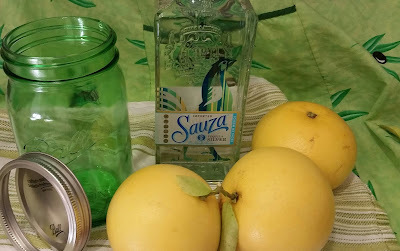 Put the peels in the jar and pour the tequila over it. 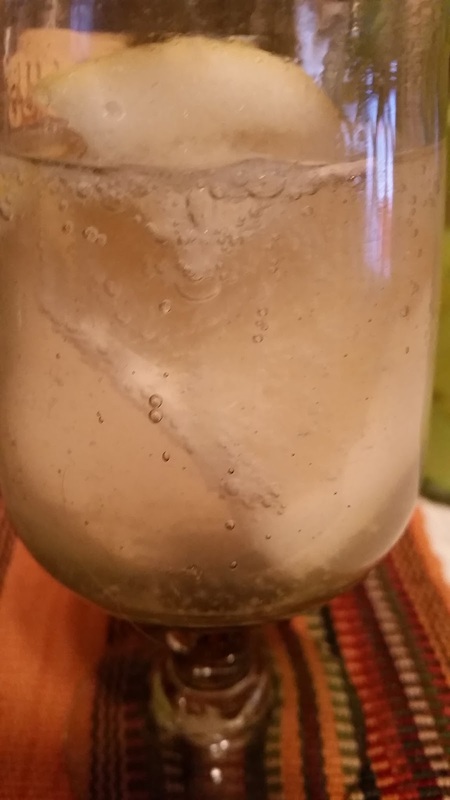 Shake the jar gently and put in a dark, cool place in the kitchen. Let steep for a week, then strain into another jar and enjoy! You know, if you're of legal age. If not, don't even think about it! I'm currently enjoying a little with sparkling water and a wedge of grapefruit (see top photo). It's delightfully fruity without being too sweet.